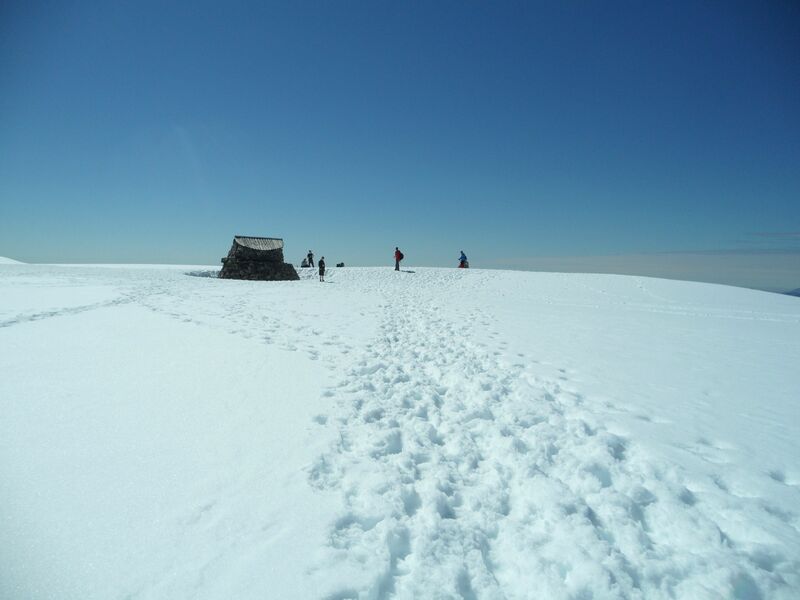 Nine days, Nine 4000'ers, Eh eight guys, a ton of porridge. 35 people think this report is great. Gaining a reputation as the outdoorsy one at your school has some serious upsides. Andy Duff from East Lothian council was looking for some keen students to join him for a trip. 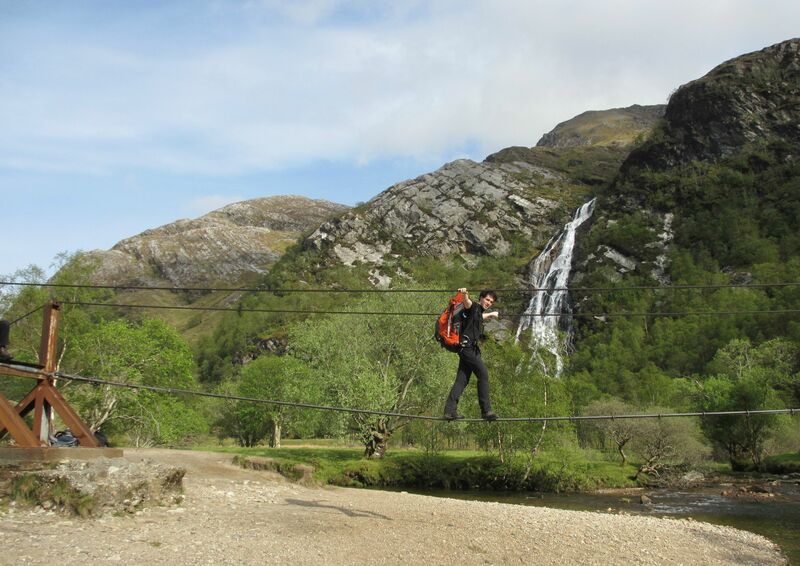 The idea was to climb all nine of Scotland’s 4000 foot mountains in one continuous and self-powered trip. This was of course right up my street and along with five others from other schools in the area signed up. 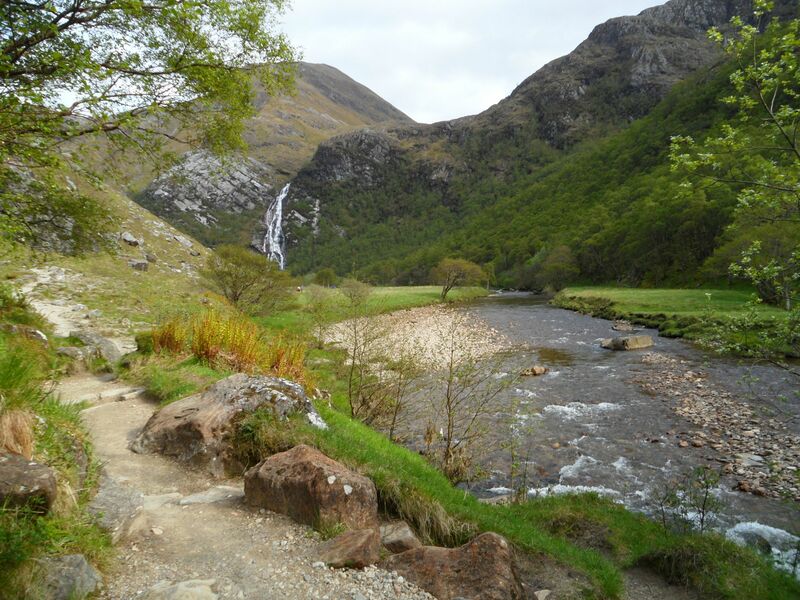 The route itself starts at the end of the Glen Nevis road and finishes at the Coire Cas car park on Cairngorm. In-between we would climb Ben Nevis, Carn Mor Dearg, Aonach Mor/Beag, Braeriach, Angels Peak, Cairn Toul, Ben Macdui and Cairngorm. In total this took us nine days, with one of them being the traveling up to Ft. William. 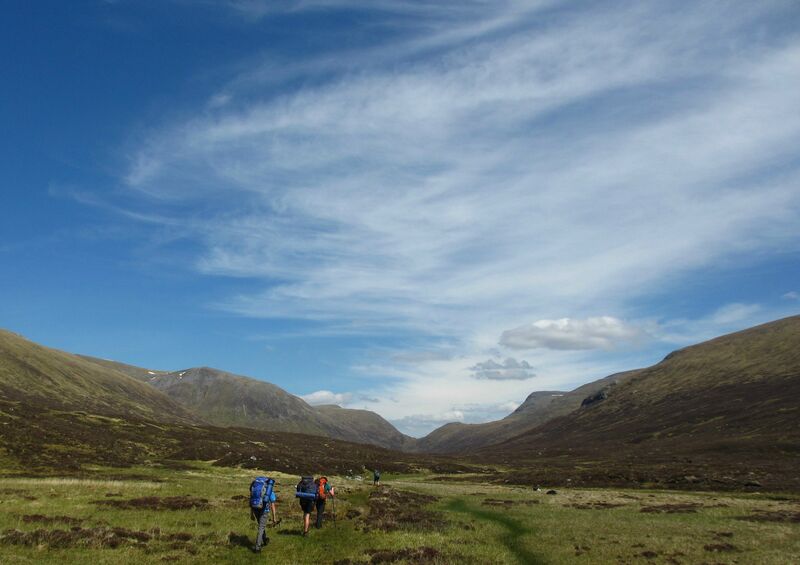 We had three mountain days; one in Lochaber and two in the cairngorms, and five days walking from Glen Nevis across to Glen Feshie. We weren’t keen to carry eight days of food with us so decided very early on to split up supplies like food and gas into three loads. One we carried up to Ft William and used by Dalwhinnie, at Dalwhinnie we collected a supply box we had dropped off before the start and then collected another box of food at Feshie lodge. This meant we could keep the weight down to a comfortable level for walking. Most of the pictures in the report are mine, but a few are Andy's - used with permission. 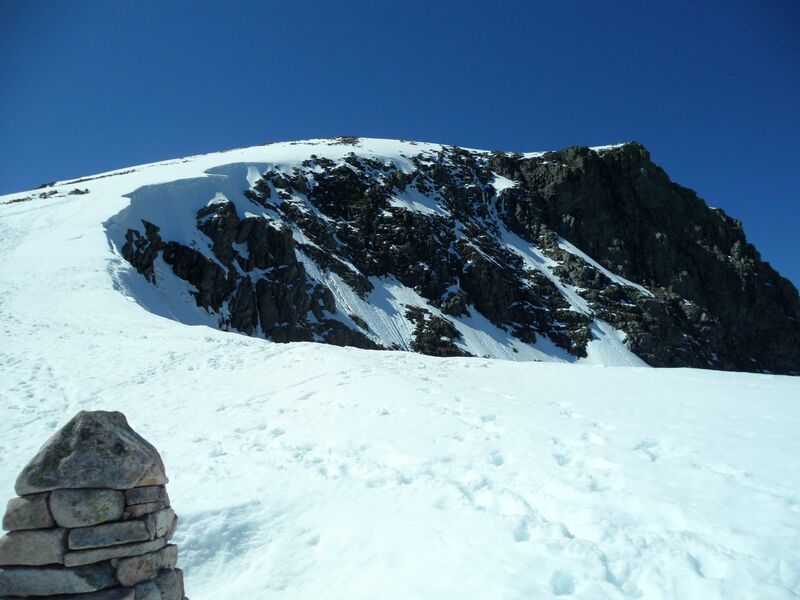 We had booked the Steall hut for two nights, the night of our arrival and the night after our Ben Nevis round. 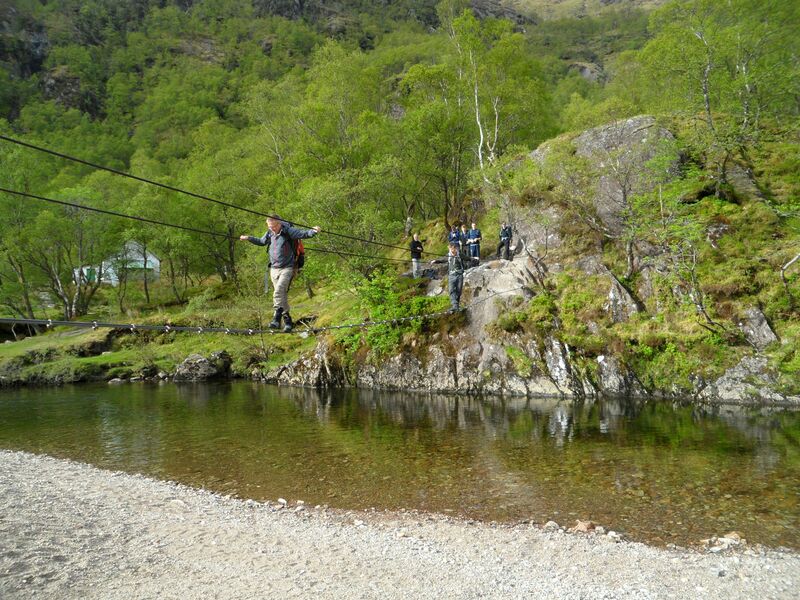 So all we had to walk on the first day was the two km to the hut, and cross the wire bridge. The hut itself is luxurious compared to the accommodation for the rest of the trip, it has a gas cooker, heating, kettle, microwave and even electric lighting. That is if you can start the generator, it took us a good half hour to get it going reliably, and if you remember to boil water and microwave haggis at the same time – too much for the system to handle. The beds are foam crash mat style things that seem to have been liberated from a school PE hall and are luxuriously comfortable. I had been a bit apprehensive about Glen Nevis in June on a windless evening, but not a single midge was sighted the whole trip. I assume the cold weekend before we came up must have killed them off/delayed hatching. The next day was our first proper day of walking. 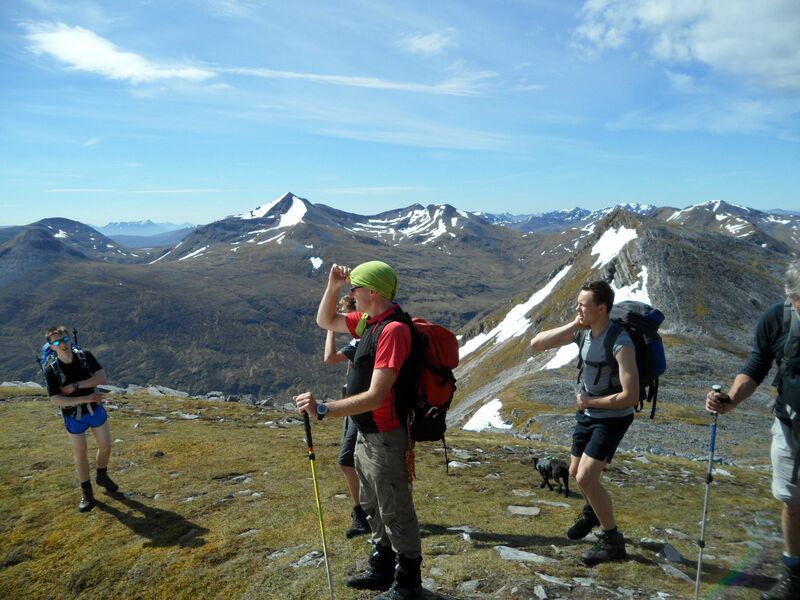 We were aiming to climb all four Lochaber 4000’ers, starting with the Aonachs and then moving along the CMD arête to the Ben and back down to the Steall hut. 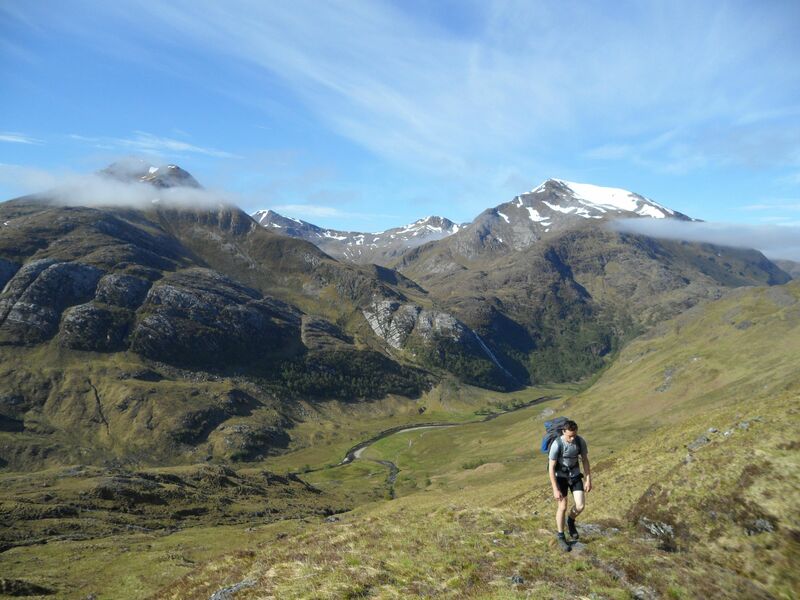 This is a pretty short day length wise at only 16.5km but racks up almost 1900m of ascent. To add to that it was an absolute scorcher of a day. We all left the hut in shorts and t-shirts at 8am. 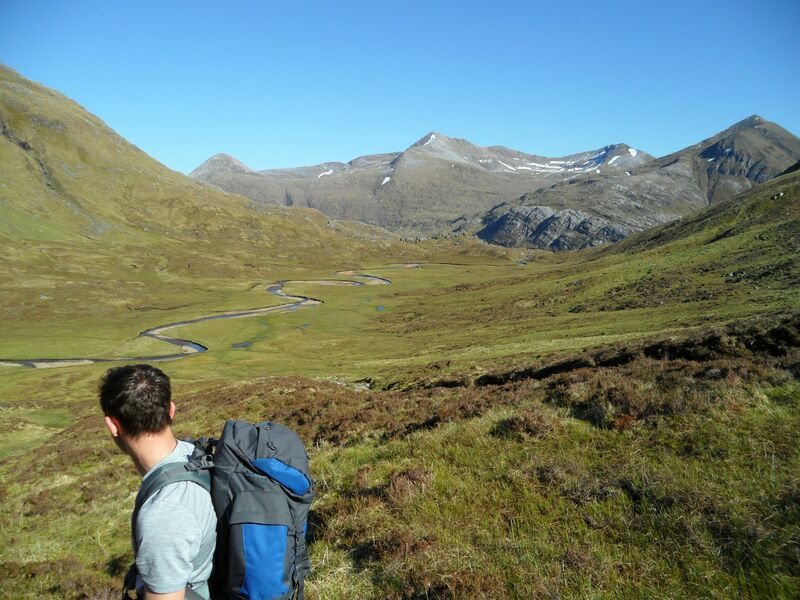 The path up Aonach Beag from the south soon disappears and we followed the river up into Coire Nan Laogh and then to the top of Stob Coire Bealaich. I’d already drunk a full 2L bladder by this point and refilled at the top of the stream. 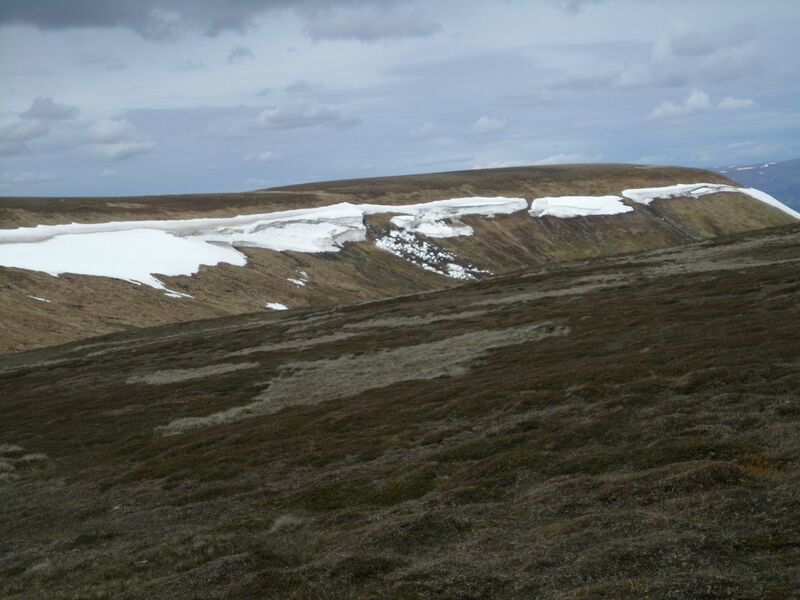 Every snowpatch was an opportunity to cool off by rubbing it into our hair and down our backs. 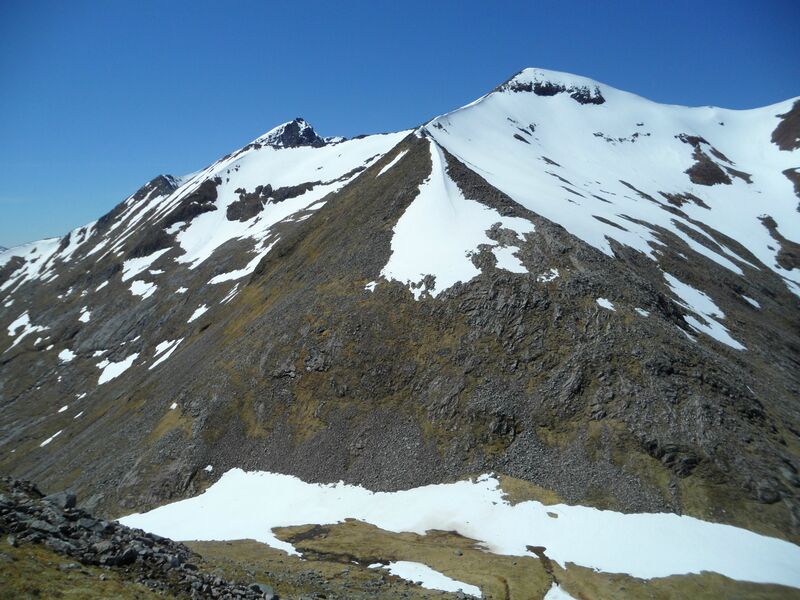 The final hundred metres of height to the top of Aonach Beag was totally snow covered and any cairn at the top was buried. 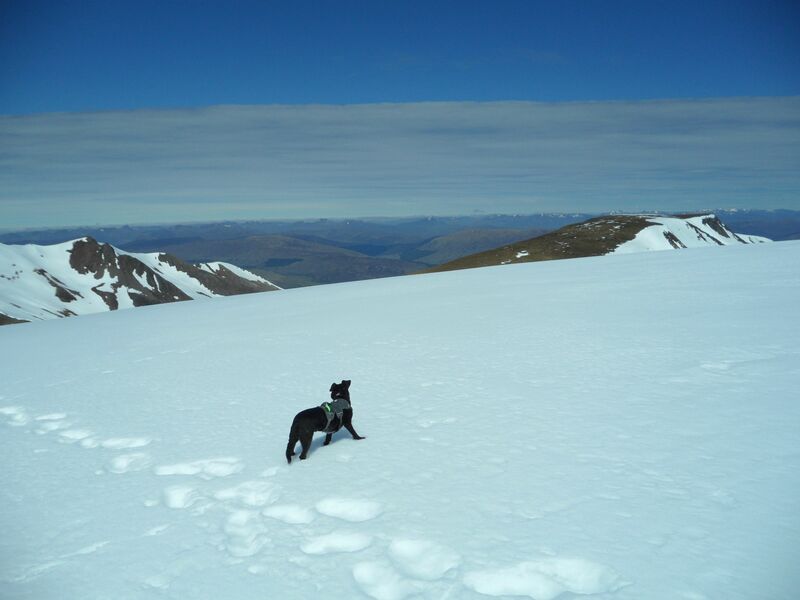 Andy’s dog was loving the snow and the rest of us were enjoying the views of the rest of the days round. We left our bags at the spur that drops down to the bealach with Carn Mor Dearg and headed off to to the top of Aonach Mor. At the top we met a skier of to grab a few June turns down summit gully in the blazing sun. Back at the bags we dropped down to the bottom of the bealach, which is a tad loose but not overly steep. 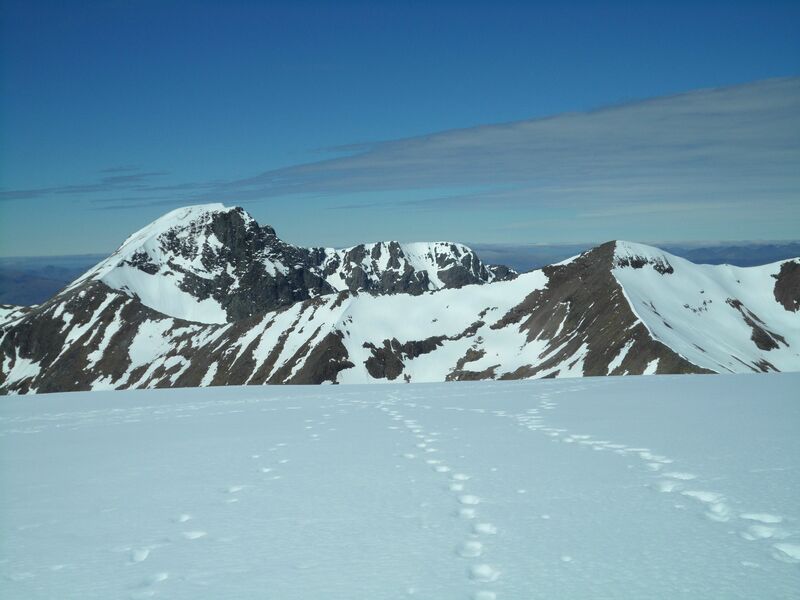 We were heading up CMD by the east ridge that join directly at the summit. It’s narrow but at no point scrambly and was blanketed with a very pleasing line of snow along its north side. 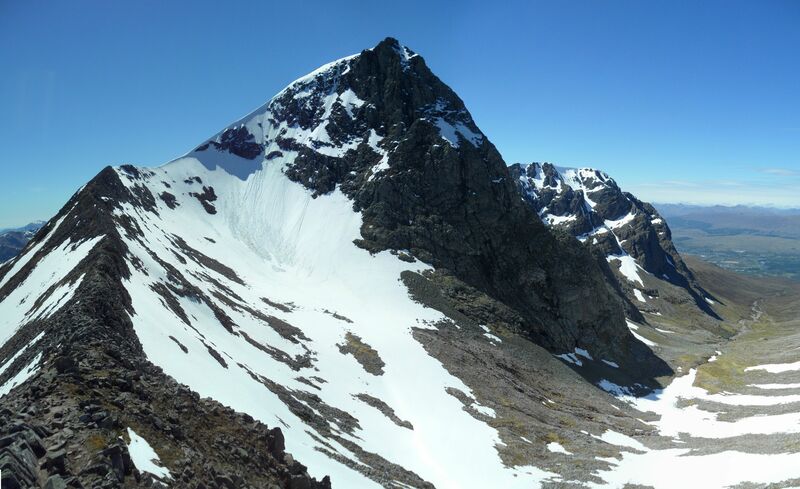 Once on the summit of CMD the views of the north face of the Ben and of the arête were sensational. It could easily have been an alpine north face we were looking at. The snow cover was very impressive for mid-june. You could hear the strong sun working on it though as several times we watched large chunks of cornice detach from above Coire Leis and fall to the bottom. We set off along the arête, I stuck to the crest for the entire duration of the ridge as the rock was lovely and dry, and I wanted to make the most of any scrambling opportunities. 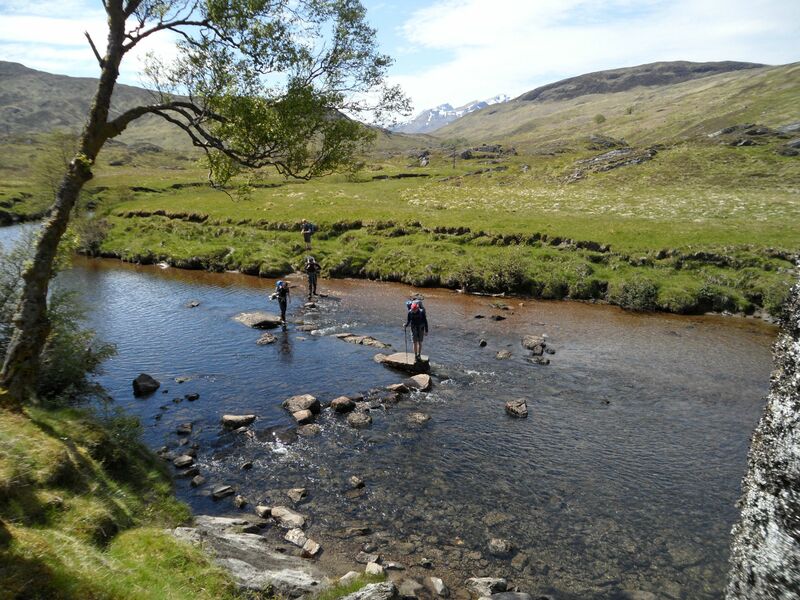 Although it is a lovely narrow ridge and the views of the Ben are superb, it is a bit light on hands on opportunities for my liking. Even taking ever boulder and step straight on it was never quite sustained enough for my liking. At the end of the ridge, at the abseil posts, we stopped for a quick break before the final pull up to the top of the ben. 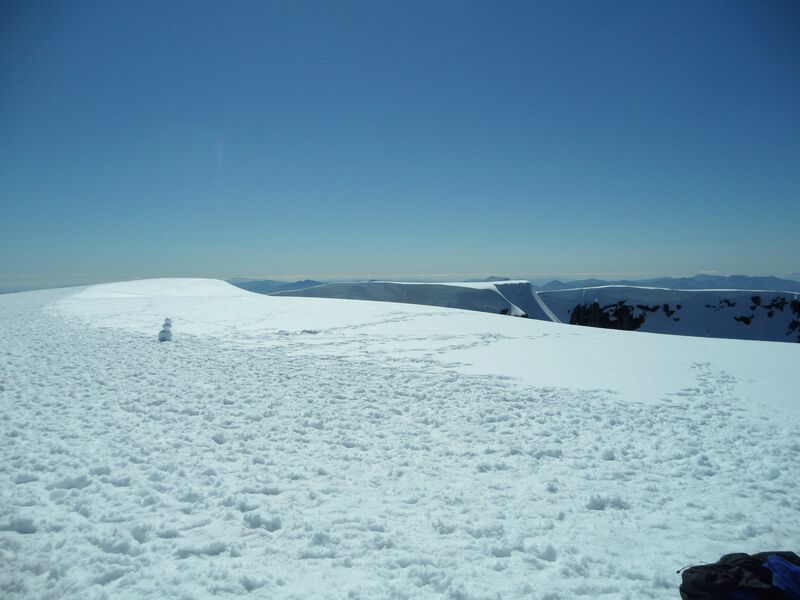 The snow from here was very soft and it was quite a slog up the knee deep slush to the summit. The next day was even hotter than the previous. 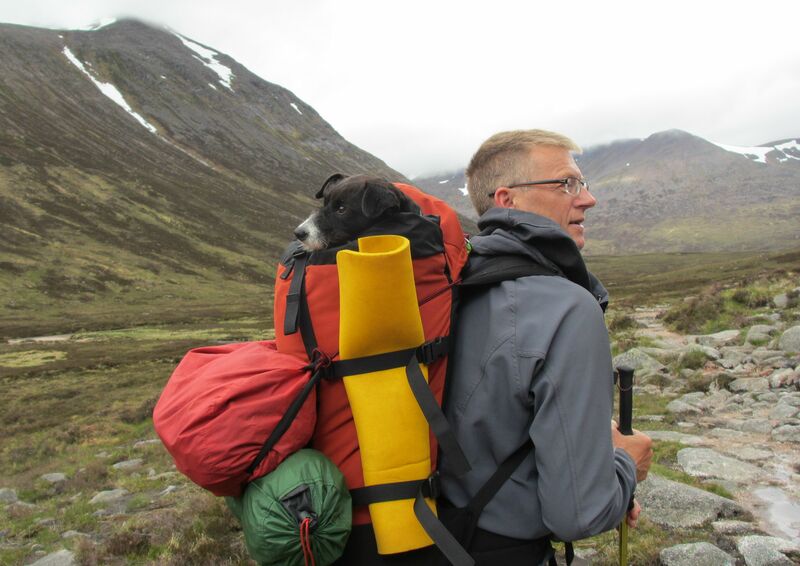 We were walking from Steall to somewhere near Corrour station where we would camp. 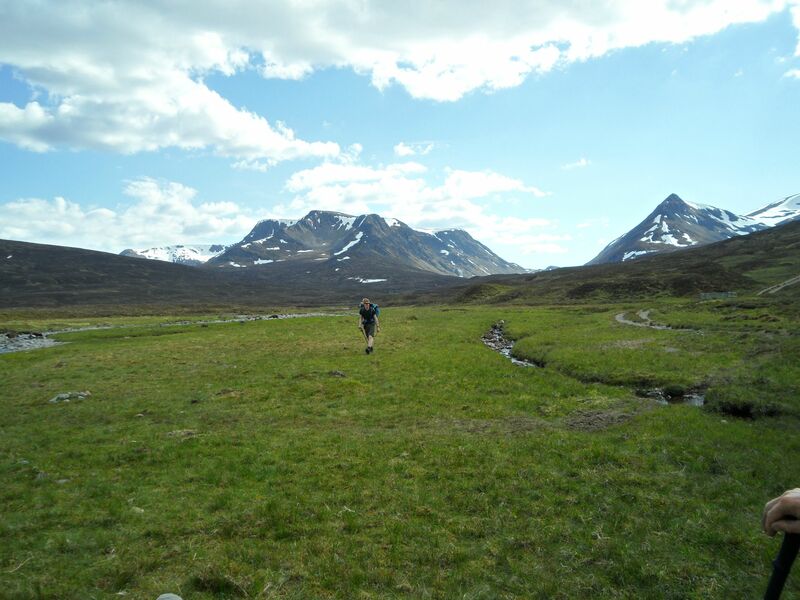 Although the route is very flat, the path is intermittent at best and very boggy in places. The heat created a new use for my buff. It would be soaked at every stream we crossed and laid across the back of my neck. 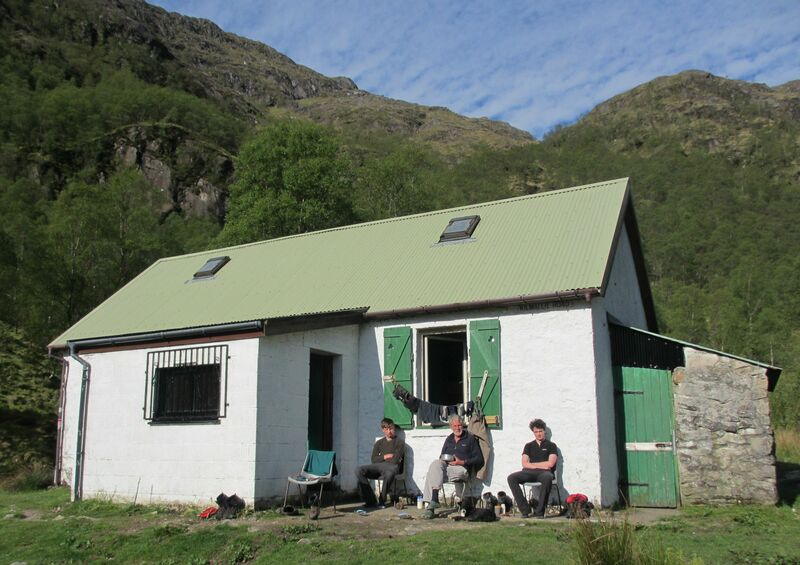 We had lunch at the staoineag bothy and carried on down the south side of the river towards Loch Treig. There is clearly a new hydro project of some sort going on at the south end of the loch, piles of piping and parked JCB’s take away a tad from the view. It was at this point that my friends boot had a bit of an accident. The entire sole unit decided it didn’t really want to be attached to the rest of the boot anymore and promptly fell completely off. This obviously presented a bit of a problem with 120km still to walk. 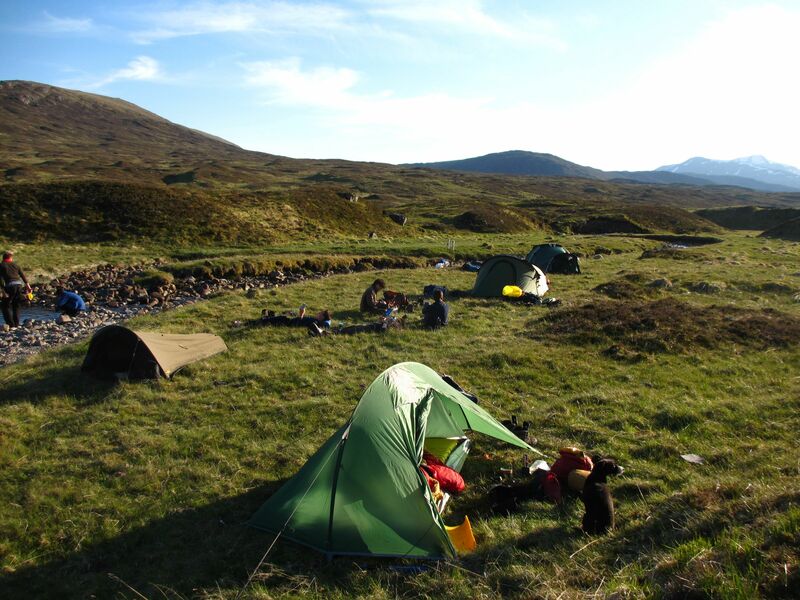 We tapped it back together with ducktape and walked the last few km’s to a nice spot near Corrour where we pitched the tents. The next morning it was clear that the boot was not saveable, despite our best efforts in strapping and tying. 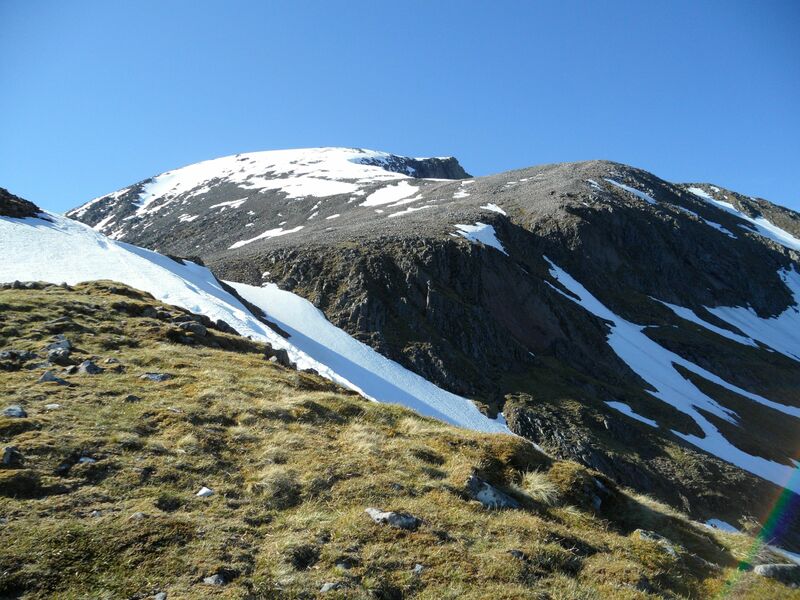 It was decided that the one booted member and other that had pulled their groin coming down Ben nevis would go home on the train from Corrour. 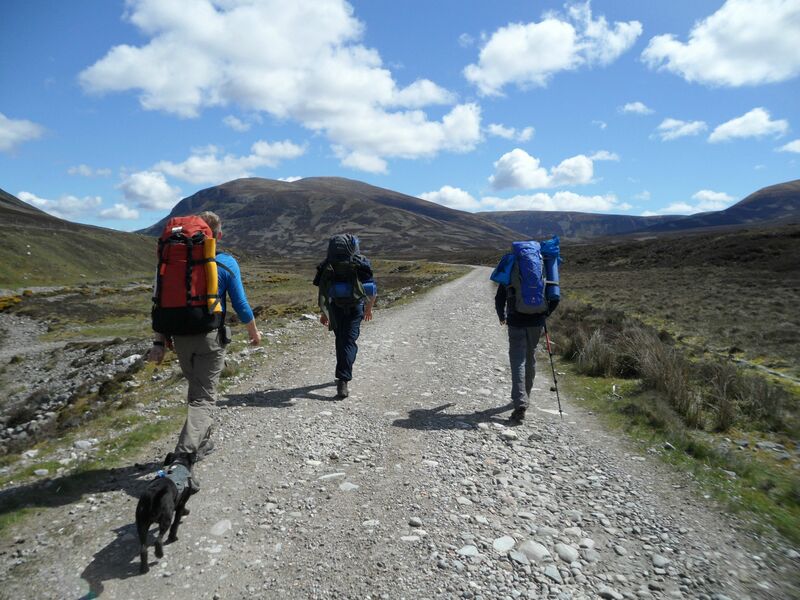 They could then rejoin us at dalwhinnie with new boots and after two days’ rest. Round the back of the station we met the lovely couple that have run the restaurant at Corrour for the past few years. Sadly the estate is now kicking them off, probably to stop them from purchasing the business after three years tenancy. From the station the bealach at Ben Alder that has to be gone over to reach Culra looks a very long way away indeed. It had also somehow managed to be even hotter than the previous two days, and by now we were running low on suncream and getting a bit tired of sweating our bodyweight. 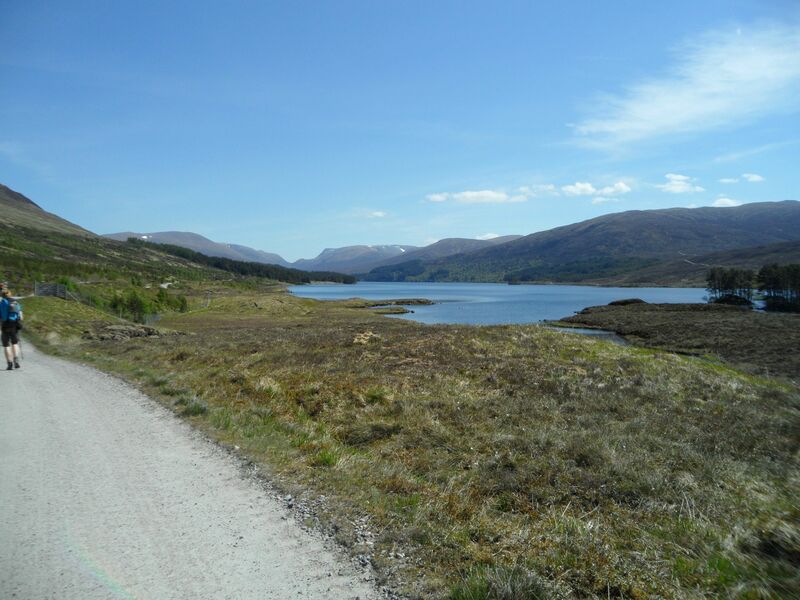 The track along Loch Ossian carries on part way up the valley as far as a new hydro dam and then turns into a small path. 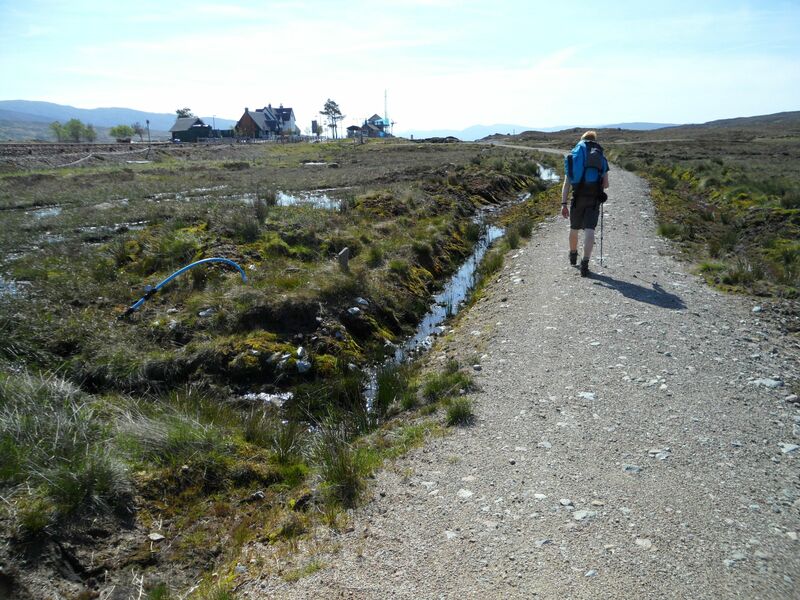 This path then too disappears and leaves you floundering around in tall heather and peat hags until you can get to the excellent stalkers path that goes over the bealach. 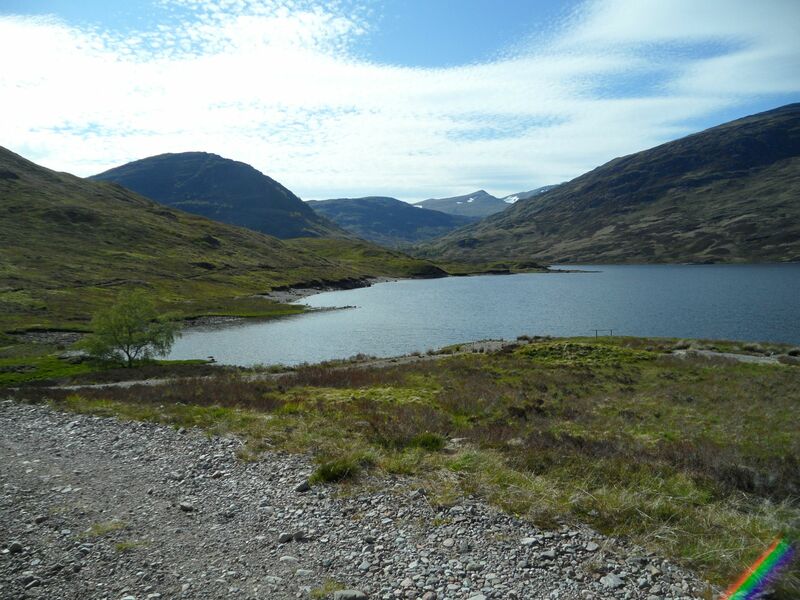 From the bealach it’s all downhill on a lovely path to Culra. 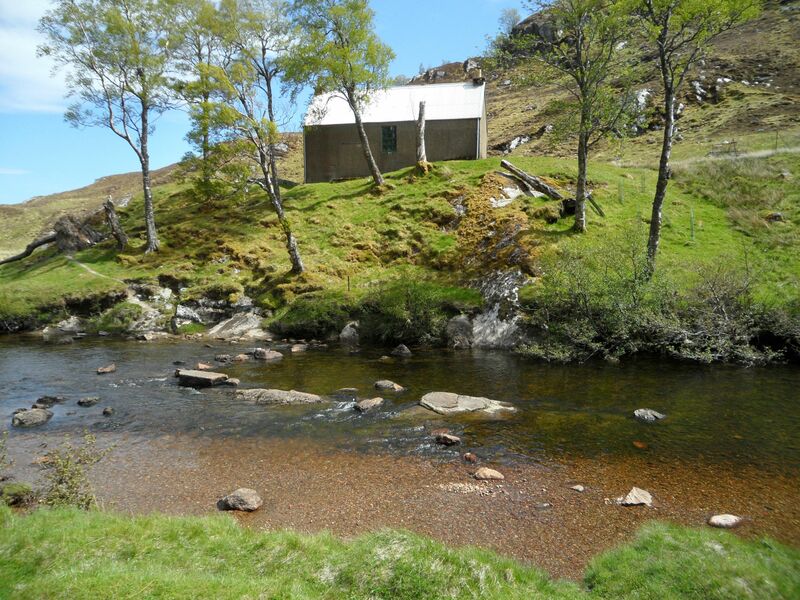 The bothy itself is a very sad sight with “Danger” spraypainted on every available surface. It had mercifully clouded over by this point and for the first time in days was a comfortable temperature. 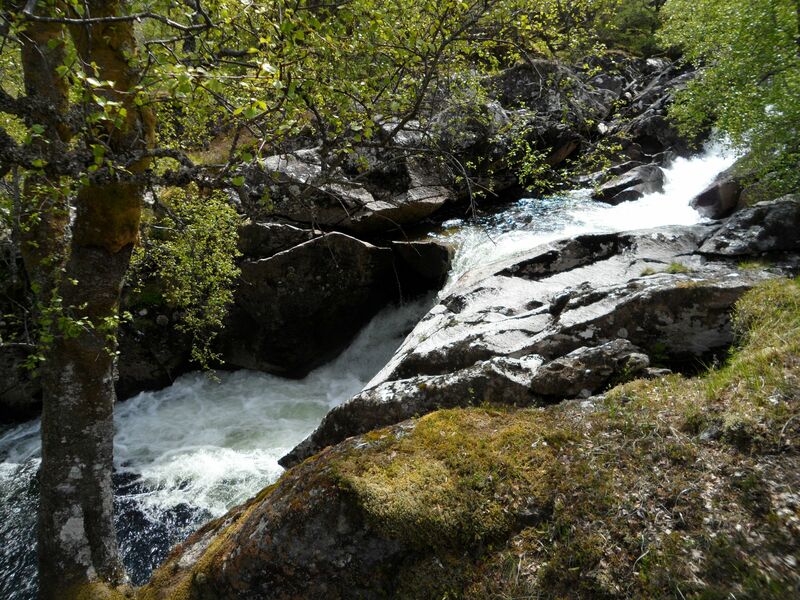 The next day was the short walk from Culra into Dalwhinnie. This is all downhill and mostly on the track to the estate house on Loch Ericht. It started raining from the moment we reached the loch and with no desire to hang about on the rather dull and very wet ten km’s along the loch we were in Dalwhinnie by half twelve. We were camping outside the bunkhouse and they very kindly offered us the bunkhouse to dry some of our kit off in. They may have regretted that decision after smelling the stuff we hung up to dry. They also very generously let us sit in the café all afternoon while they were closed and then served us a delicious dinner. 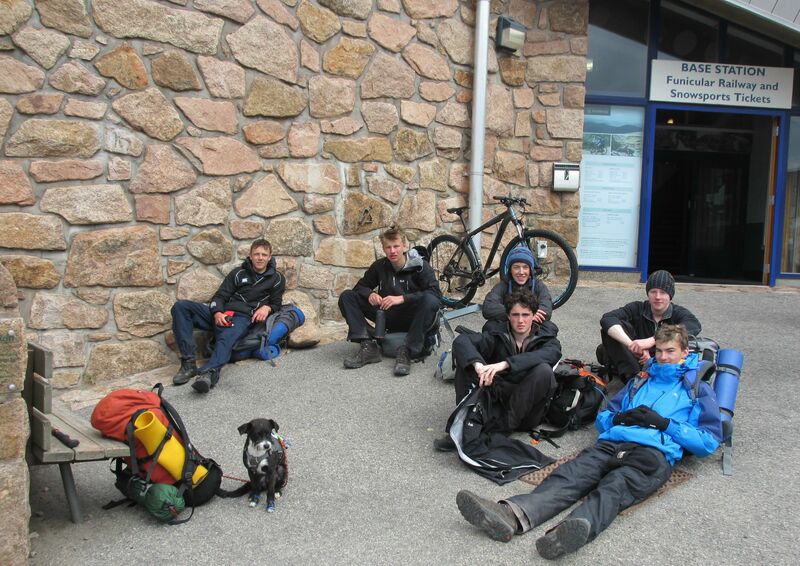 The group members that had left at Corrour rejoined us here after being dumped at the side of the A9 by the bus. The next morning was one of our groups 18th birthday. We did consider a tour of the distillery but thought 9am on a Sunday was an unlikely opening time. After possible the biggest fried breakfast I’ve ever seen we set off along the aqueduct and along to the base of Meall Chuaich. From here we took the zig-zagging stalkers path up onto the plateau and across towards Gaick. The descent down to Gaick is very steep but another excellent stalkers path makes short work of it. 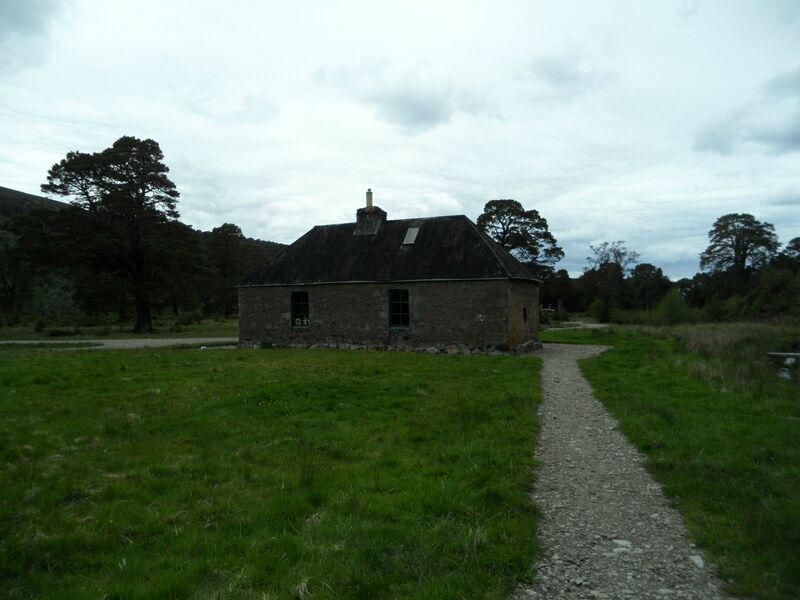 The lodge looks lovely and very well maintained compared to far too many highland lodges that are become dilapidated. 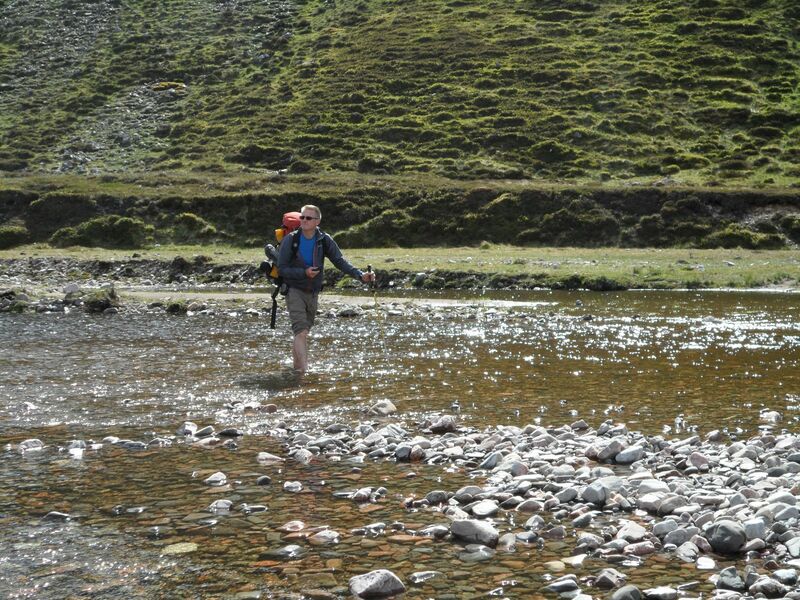 There is no bridge across the river so it was a flip flops on and wade job. After find a flat spot far enough away from the open pit of dear heads we pitched up and lazed about in the sun. There was enough wind to keep the smell of death away from the tents and any midges at bay. We had a fire that night on the shingle in the middle of the river. There was of course another steep climb up out of the glen the next morning back up onto the plateau. It was cloudy again this day but still pleasantly warm. 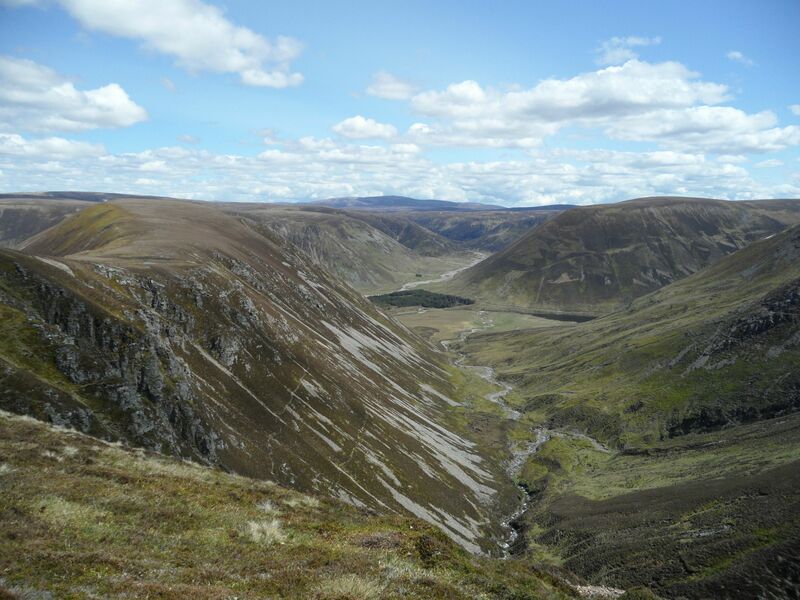 We were heading across the plateau, over the Corbett of Leathad an Taobhain, and down into Glen Feshie. 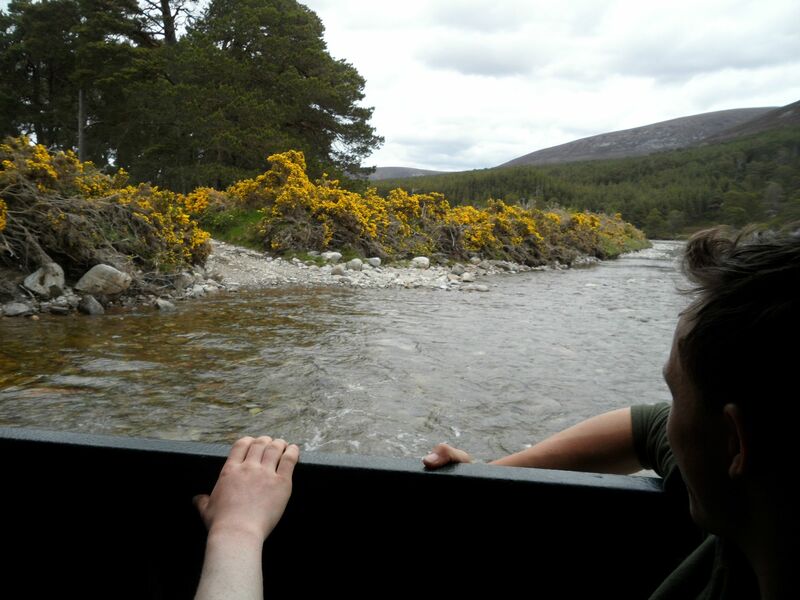 We picked up our last food box at Glen feshie and were offered a lift across the river by the very kind estate staff. We bundled all eight of us plus backs into the landrover and got driven across the river, saving us a wade or lengthy detour. We walked down the track to Ruighe-aiteachain and spent an hour chopping up a nice pile of wood the estate leaves outside the bothy for the stove. Six of us stayed in the bunks in the first room of the bothy. There was only one other person there who took the room with the very good cast iron stove. We built the fire up in the stove and used it’s flat top to boil our water. The next day the cloud was hanging low and I didn’t have much hope for seeing anything in the cairngorms. 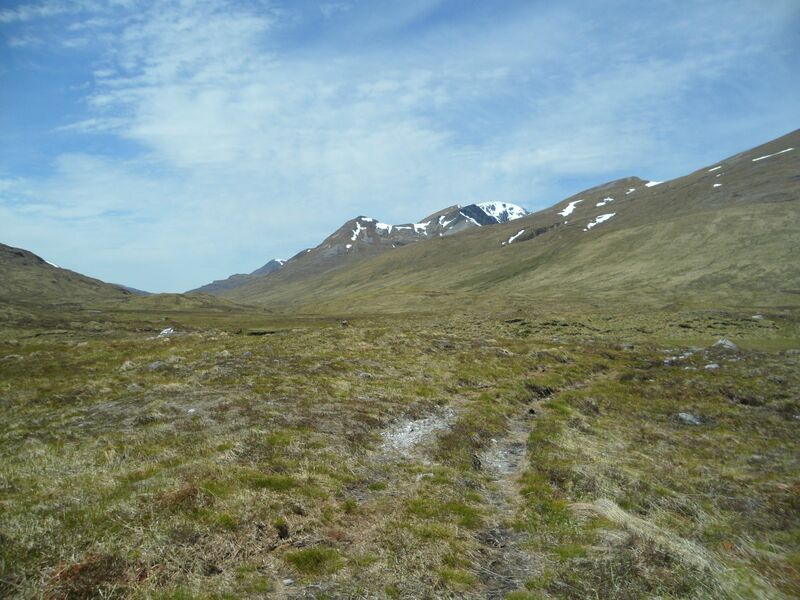 We headed up the track just north of the bothy that goes right past the summit of Mullach Clach a’ Bhlair. A munro I couldn’t resist bagging on the way past. 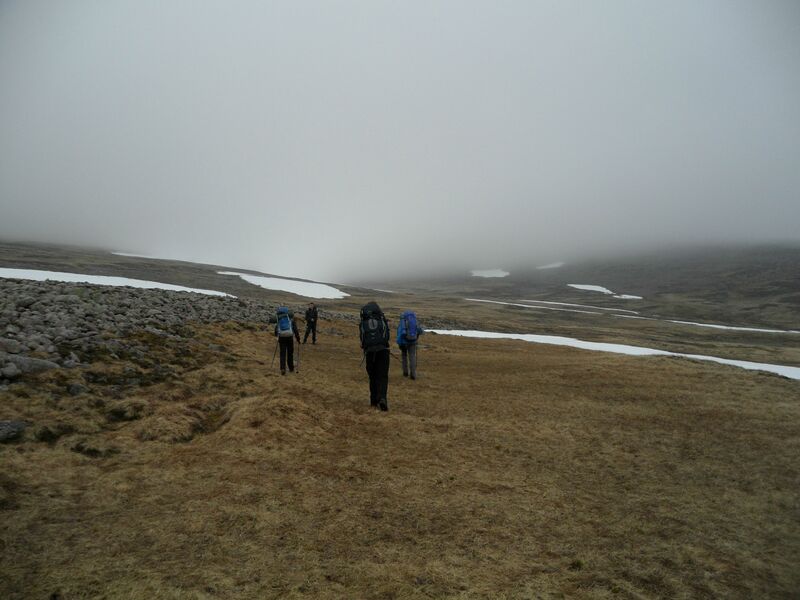 We then crossed the Moine Mhor in the clouds. 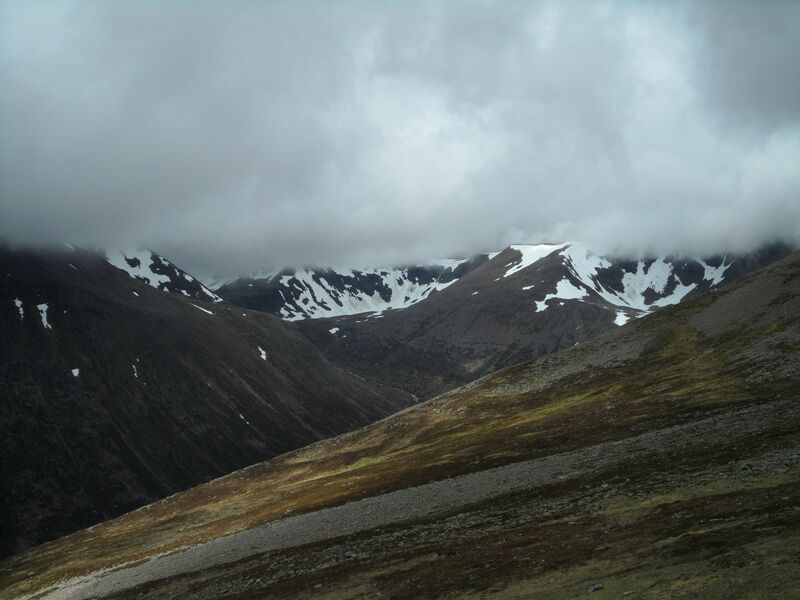 The rather unremarkable plateau had some interest added by stumbling through a very large camp in the mist. What I can only assume was a school DofE camp at loch nan Cnapan had 15 or so tents sprawled round in a large circle with rucksacks and supplies spread about, but no sight of any people. 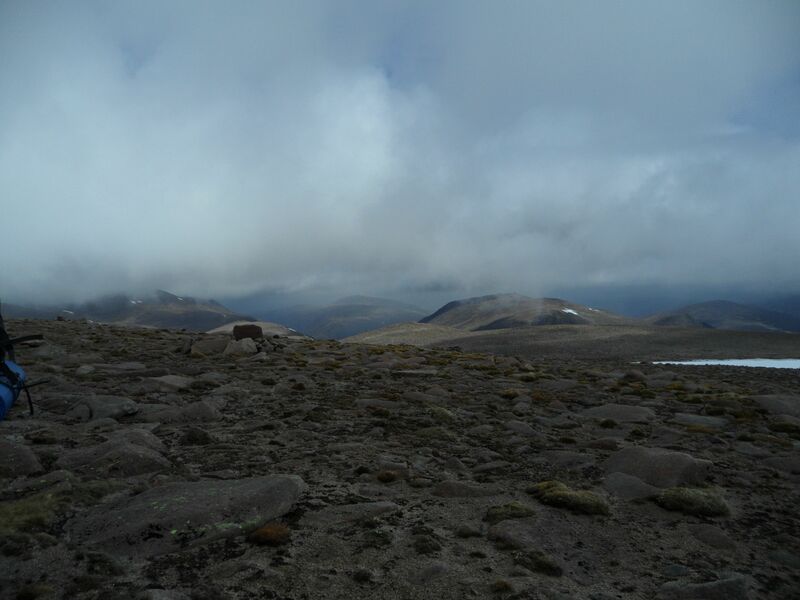 We followed a stream up to the low point between Braeriach and the Angels peak where we left our bags, headed round to the top in the mist, then picked up the backs and headed over Angels peak and Cairn Toul in the rain and mist. Dropping down to Corrour bothy meant negotiating the snow still ringing the top of Coire Odhar. 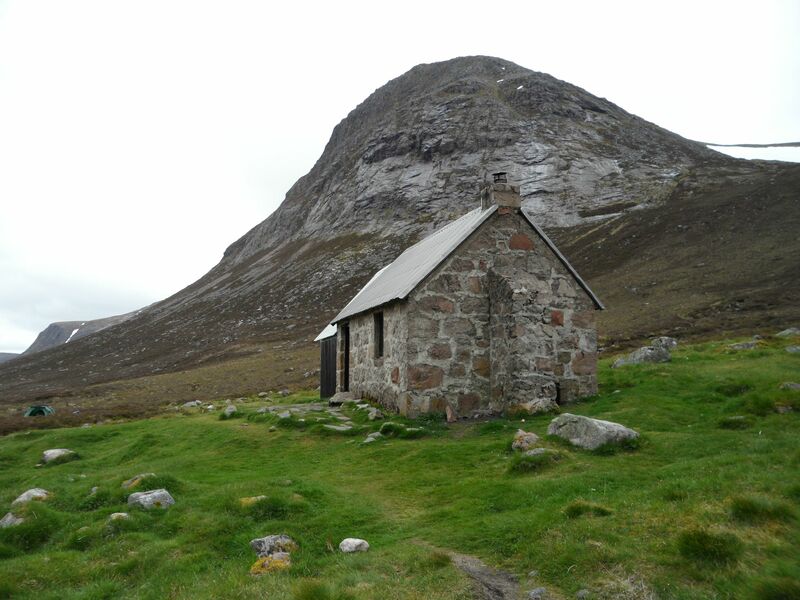 The bothy was taken by a group of army guys so we camped outside in the strengthening wind. It was here that I noticed I had been upstaged in the weight saving front. In an attempt to take as small a toiletries bag as possible I had cut my toothbrush in half. I was however supplanted by another group member who had so severely trimmed his that he could only hold the stump that was left between his thumb and forefinger. The next day we headed up the Taillear burn onto the summit of Ben Macdui in very strong winds. By now Andy's dog, that had walked all the way from Ft William was tiring. She had also hurt her paws on sharp dry heather. So into the rucksack she went. 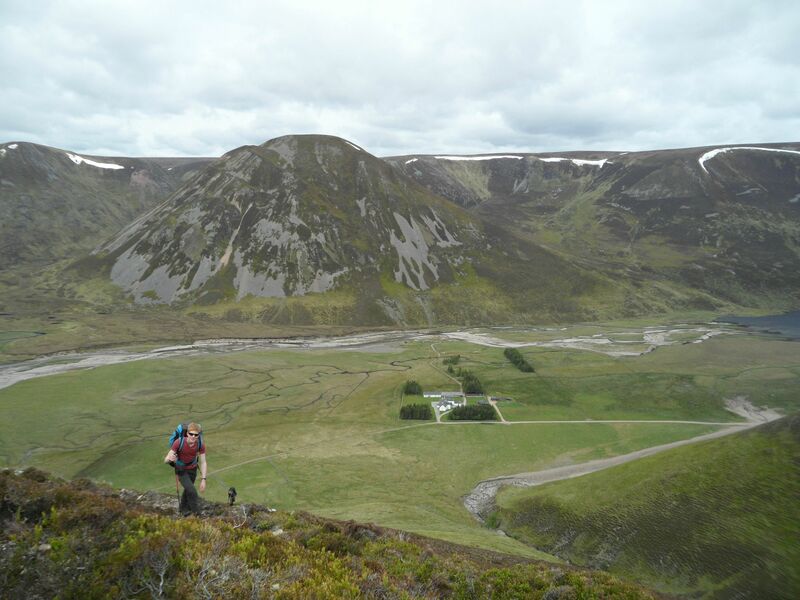 The climb from the Lairig ghru seemed to be unending but it certainly gains you height quickly, it’s just that you’ve got a lot to go up. 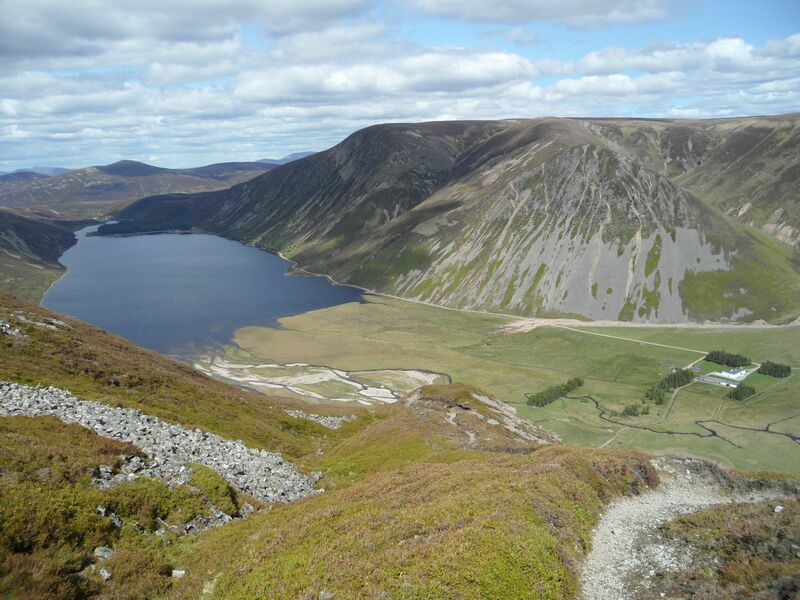 We didn’t hang about on the summit and headed round over the plateau to cairngorm and our last 4000’fter. We practically ran down to the carpark to collapse into the café and appal all the diners with the stench I’m sure we gave off. It was then down to a chippy in aviemore for something deep-fried and covered in salt before the train back to Waverly. The local paper ran a little item on it the week after we got back, and i'm fairly sure those are the shortest shorts to have ever been featured in the Couriers pages. Last edited by Euan McIntosh on Thu Jun 25, 2015 7:38 pm, edited 1 time in total. 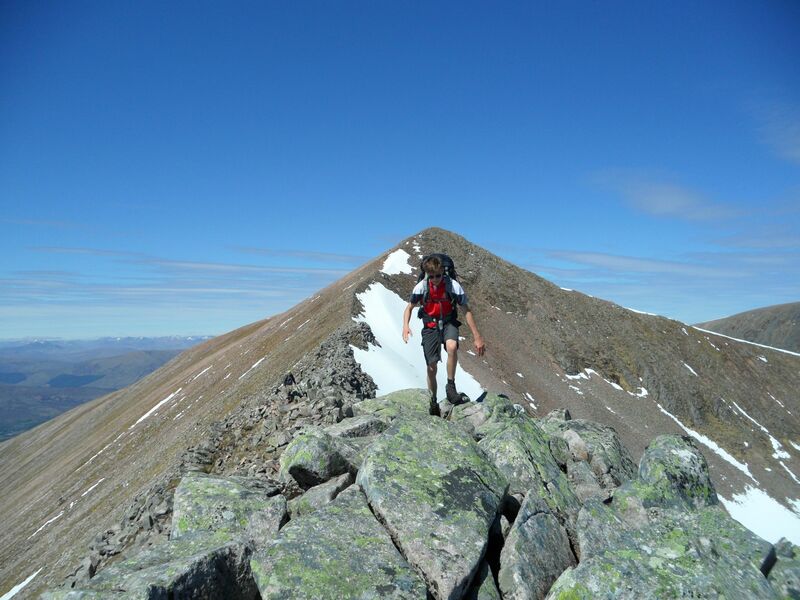 Re: Nine days, Nine 4000'ers, Eh eight guys, a ton porridge. That was a fantastic read and brilliant photos First of all congratulations to all who took part, and then congratulations to East Lothian Council for organising the trip - I'm not sure all local councils are so enterprising. 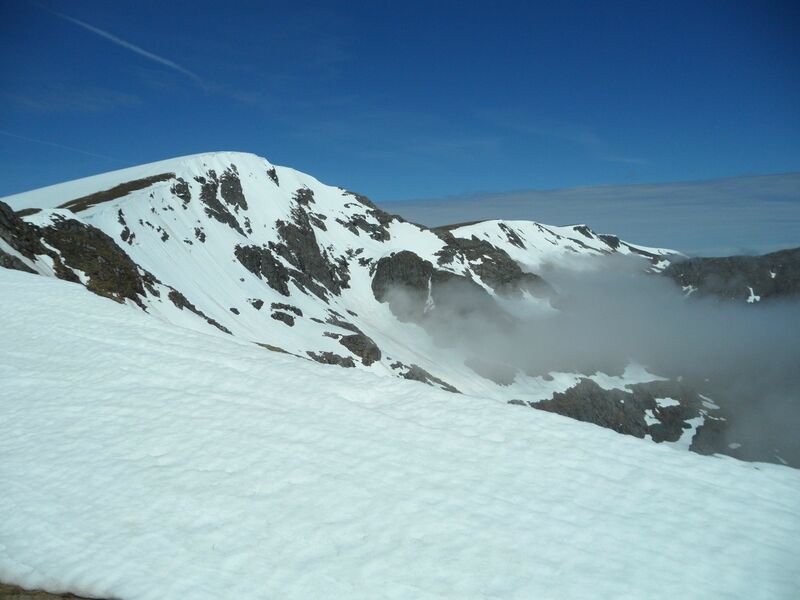 You certainly had excellent conditions for the Nevis round. 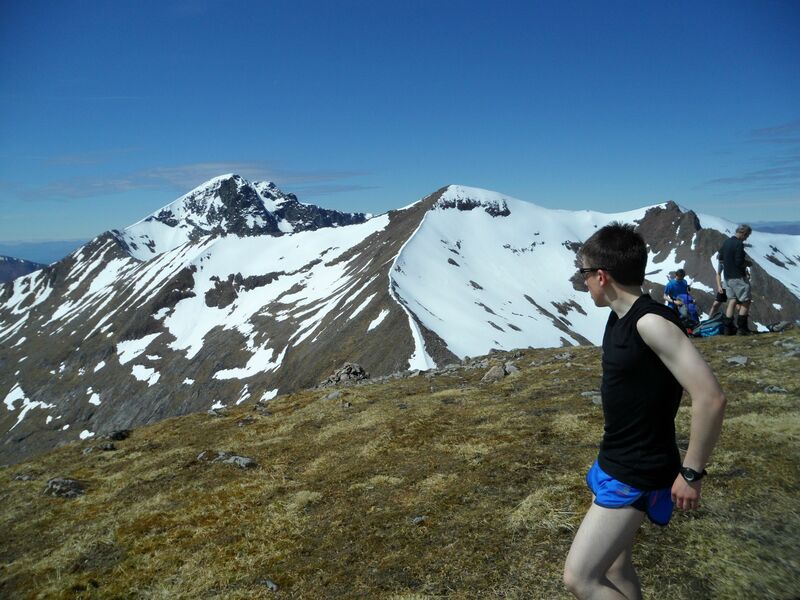 A great read and well done for tackling the 4000ers this way. I feel a bit of a cheat using the car to get to the start of my hill walks. We used to book Steall hut for a weekend every February when at university - don't think there was a generator then and one of the coldest places I've ever stayed. 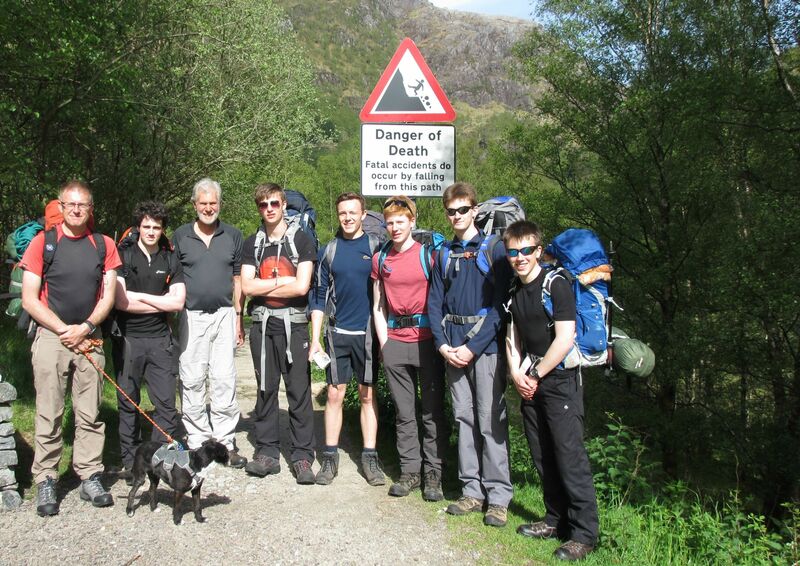 Better than Edinburgh University though, who camped out in the Steall meadows for a weekend one February. 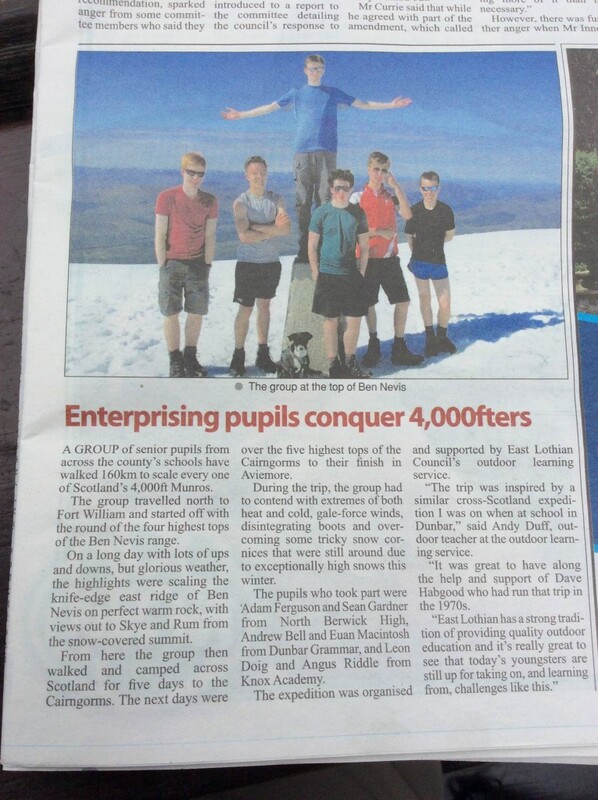 Great report...I was on the CMD arete on 10th June... was that the day you guys were up there. I think I saw you making your way up towards the arete whilst I was traversing it. 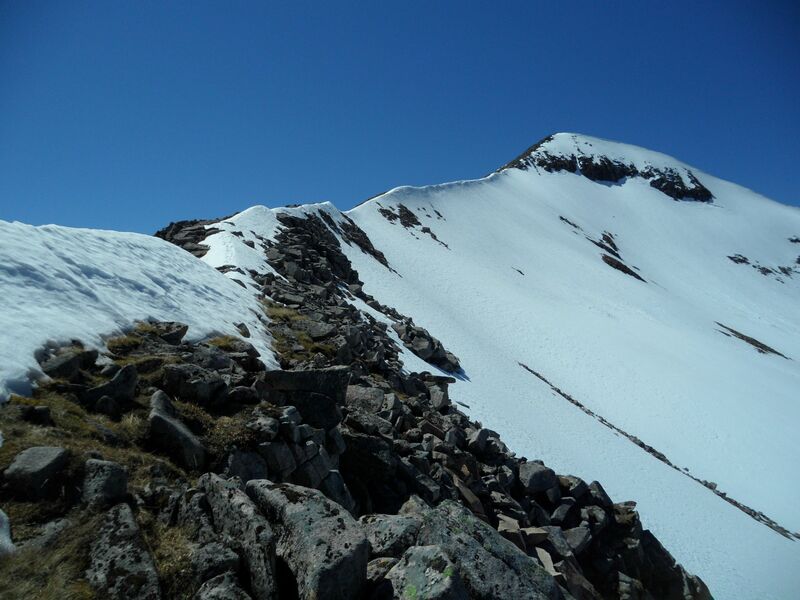 It was a slushy slog to the top of the Ben. Speedtrip: Yeah that will have been us you saw on the 10th. 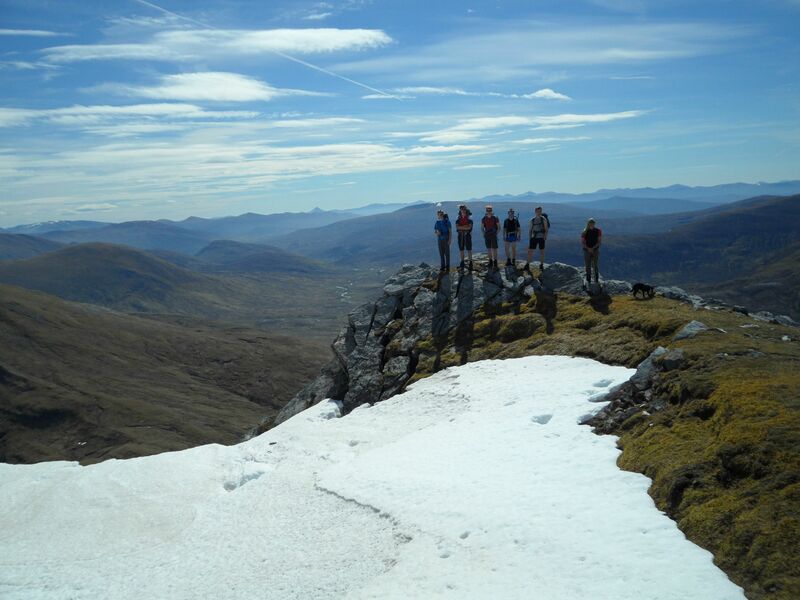 We saw a few people on the ridge from the Aonachs so that might have been you. I feel the shameful pangs of envy in some force, but still managed to read it twice. teaandpies: apart from the first day that was pretty hard just for the amount of ascent, most of it was no harder than i'd expect a normal 20k day to be. We got into a nice rythm and by the end were used to getting up and just walking. Absolutely brilliant, well done lads. Only just noticed this report. Fantastic effort everyone involved. It's great to hear about young people doing something like this, far too many of them waste their time smoking, hanging about and doing drugs, then complain there's nothing to do.